BROOD is always in need of good foster homes. Many rescued bassets come to us starved, neglected, beaten or abused. Some are given away because they were "too big," "too old," "shed too much," or replaced by newer pets or even furniture. Some have had beloved owners die. No matter the physical health or appearance, dogs are often emotionally distraught and confused by the loss of their former homes. BROOD has successfully placed thousands of dogs over the years, however finding the right adoptive home takes time! We strive to match hounds and families, so our dogs will not suffer the same emotional traumas in the future. This is why foster parenting plays a crucial role in rescue. As a foster parent, you make a commitment to provide a temporary home while BROOD searches for an adoptive family. BROOD asks you to provide love, emotional support, special loving attention and in some cases administer medications during the transition. In addition, you'll give us feedback about the dog so that we can ensure a good match. BROOD in return will pay for all pre-approved medical expenses, and most everything required to care for your foster. No other job in rescue is more rewarding than fostering. You will experience the transformation of a sad, lonely, confused dog into a happy, healthy, loving pet. You will share the joy of knowing you played a crucial role in making it all possible as they leave for their new permanent home. Our need for foster homes is ongoing. We typically require about 20 or more foster homes for our bassets who instead are spending their days and weeks in our kennels at a cost of over $18 a day. A gift of your time and home by becoming a foster parent is just as important as making a donation, and will provide these dogs with the love they need while waiting for their forever homes. To become a foster home, you will need to complete a Fostering Application. Complete and sign the Fostering Agreement (PDF file requires Adobe Reader). You must complete and regularly update a Foster Dog Report on your foster. The Vet Reimbursement Form is to be submitted online or printed out and submitted with vet bills for foster dogs. The Foster Dog Photo Guide provides tips for getting good photos of your foster for the website. What kind of facility is required? If you share your life with a basset now, chances are that your home is fine. A fenced yard, fresh water, and a shelter are the basics. How much notice will I have? Normally one to two weeks. What do you do when you can't find a foster home? If we have sufficient funds, we may be able to board the dog at a kennel until a home becomes available. If funds are low, we are sometimes unable to provide assistance. This is why foster homes are critical. What will I be responsible for? Providing a safe, loving environment, exercise, food and fresh water. We also rely on foster homes to provide a foster report of the dog's behavior and attitude, to keep an eye out for and report problems. What will BROOD be responsible for? BROOD will take care of all pre-approved medical bills for the dog. What if the foster dog doesn't work out in our family? We will take back your foster at your request. What if I foster a dog and love it so much I can't part with it? BROOD understands we sometimes fall in love with the dogs we foster. There is even a name for it: "Foster Failure." BROOD's policy on fosters adopting their foster dog was developed with both the foster and the adopter in mind. We want to be fair to both of you. 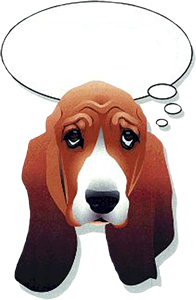 Remember, there is a list of approved adopters who have been waiting for that right hound to come along for them to adopt and fulfill their dreams of owning a basset. When you adopt your foster dog, you have essentially leap-frogged ahead of all those who have been patiently waiting (some for a long time) to adopt. So if you feel you are going to be a Foster Failure, you must contact the and IMMEDIATELY and declare your desire to adopt your foster dog. Provided you have had the dog for at least two weeks AND no other approved adopter has set an appointment to visit your foster, you will be approved to adopt. How long will I keep a foster basset? This greatly depends on the "marketability" of the hound. Young dogs are usually adopted quickly, within a couple of weeks. Older dogs and those with medical or behavior problems take longer. We like to keep a hound for at least ten days in order to evaluate its behavior. In the case of a dog whose history is known, the turnover time may be shorter. I can't foster right now, but I'd like to help. What can I do? Monetary contributions are welcome! Donate now or consider becoming a virtual foster for one of our kenneled dogs. You can also volunteer to pick up dogs or transport them or help with other rescue activities. Go ahead! Apply to become a foster home or now!